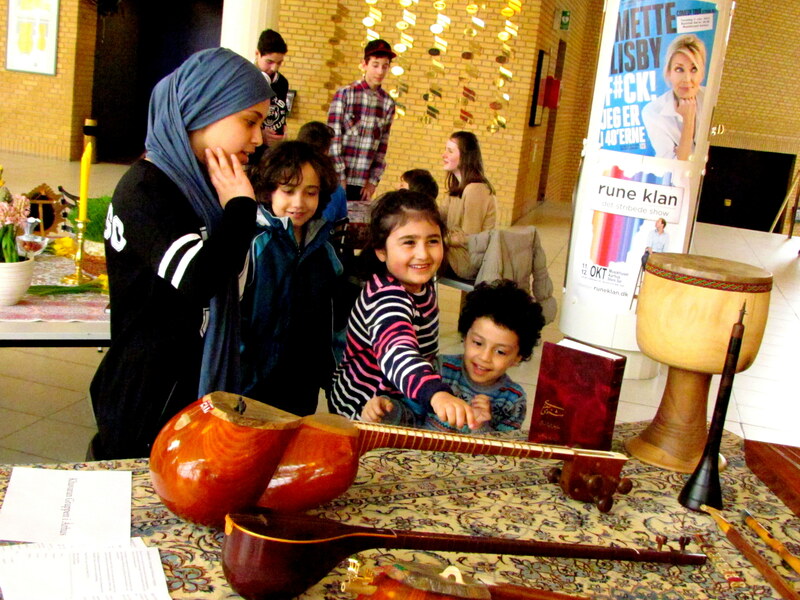 Between dances, music and paintings, the Iranian community in Aarhus welcomed its new year with a whole day festival for the first time. It is as much spring one could expect these days in Aarhus. The sun is shining over snow-covered meadows and cleared pavements as well as through the glass walls of the Musikhuset. Inside this cultural center, bright beams reflect in a crystal water jug, wherein two gold fishes turn their circles. They are a decorative part of a typical Persian New Year’s table setting, called “Haft Sîn”. Nowruz, how the Persian New Years’ Day is called, marks the beginning of spring and the first day of the Persian Calendar. 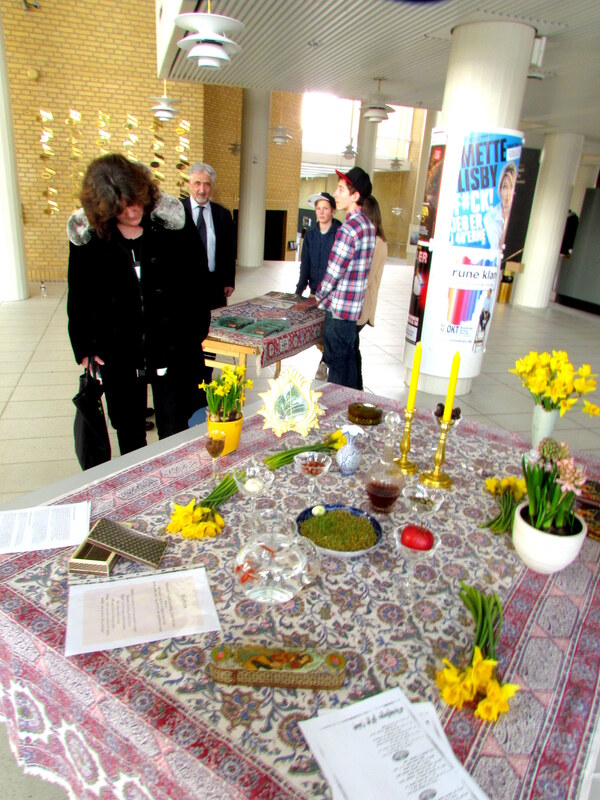 Due to this special event, several traditions were presented by the Iranian community in cooperation with the Khavaran group for Persian culture, on the 22nd of March. “It is the first time that we celebrate it as a one-day festival at Musikhuset”, said Camilla Dayyani, a 37 years old jazz musician and head of the organization team. The years before, there had been only single concerts on Nowruz, the Persian New Years’ day, but this time they planned to go further: “My father Said loves the Iranian culture, and he had this idea for many years to present all this”, meaning literature, music and other artistic work, which were presented on stage and different tables. “Recently, one hears mostly bad news from Iran, and now we want to present another side”, Dayyani explains, visibly happy about this opportunity. Quietly smiling, Dayanni´s father walks around the forum and shakes hands with his arriving friends and keeps on hugging his daughter proudly and kissing her cheeks, once she passes by. Among the visitors, Hadji Pirouz is on his way. He is an elderly man, dressed in red with a black painted face. “ (He is) a little bit like a Persian version of Santa Claus; he sings traditional songs and brings sweets to the children”, explains Dayyani. Numerous Persian carpets decorated the entrance hall of the Musikhuset, hanging from balconies and behind the stage. It was a sharp contrast of reddish-brown traditional tapistry against the snow-white walls of modern Danish architecture. But sometimes it is especially the contrast that could awake curiosity. “We want to bring the people together with this festival”, remarks the jazz musician. During the day, some hundred visitors find their way to the festival. “It’s very nice here”, says Karin Lykke, a 50 years old woman. She sat around a table with some friends to listen to a jazz concert: Ancient poems of Omar Khayyam, on which Dayyani composed a suite for piano and sings the Danish translation of the Farsi lines, supported by an international music ensemble with clarinet and drums. Traditional string instruments, in contrary, could rather been seen as heard. Nasser Tabesh presented not only his collection with Setar, Tambour and Kamanche, but showed also how to build these instruments with their round bellies, made of mulberry wood slices. 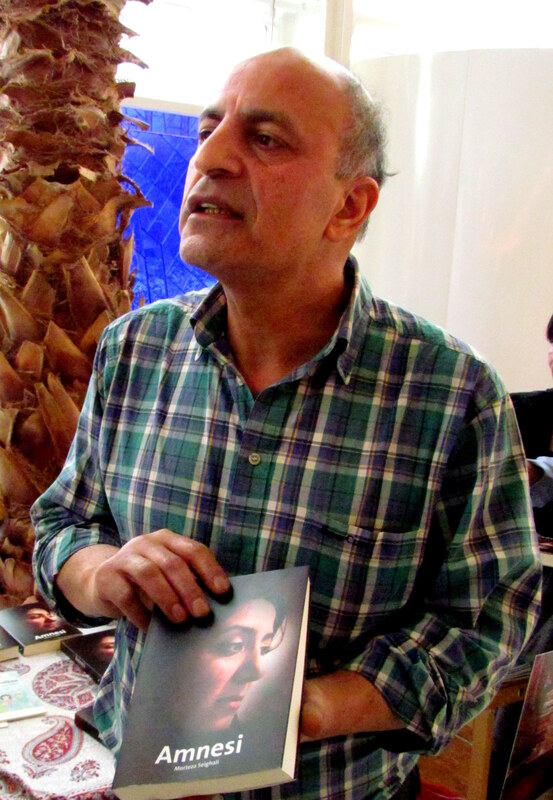 He came to Denmark at the beginning of 1980´s, in times of the First Persian Gulf War, at the same time as many refugees and also like the writer Morteza Seighali, who presents his book “Amnesi” at the entrance of the cultural center. It is a novel about an Iranian woman who lost her memory. Originally, he had planned to write his autobiography, as Seighali said, but inspired by the Arab Spring, he wanted to describe the bigger picture of the social and political situation of his time back in Iran. But as Persia is not only referring to Iranian culture, also Kurdish and Azerbaijdianian groups performed traditional dances and music on stage. “Originally, we also planned to include more cultures, but we ran out of time while organizing it”, said Dayanii. She hopes to repeat the festival next year . “Maybe it becomes a new tradition”. Furthermore the table contains also other symbolic items like rose water, honey, milk (nourishing food and cattle) a book (Ketab, which stands for wisdom, and is often represented in a copy of the Koran) a mirror (Aijneh, stands for honesty and reflection), gold fishes (Mahi ghermez, life and activity, but also connected with persian mythology and the vanishing zodiac Pisces which is due until 20th March) and coloured eggs (tokhm, which symbolize fertility).